See All Five All-New Creations in Action and So Much More! Coming this September, Golden Tee 2015 featuring FIVE all new courses. Where will be teeing off this year? Here’s a rundown of the exciting lineup. 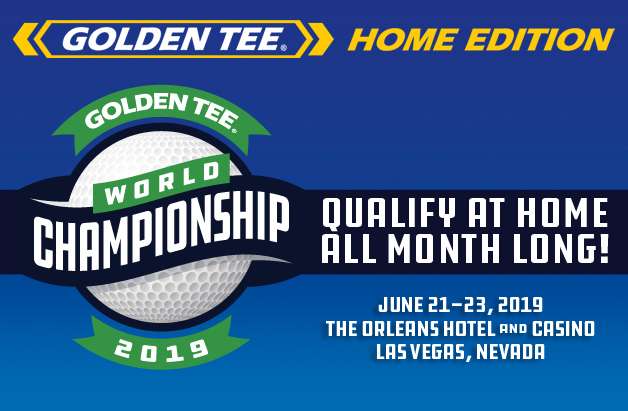 Stay tuned to Goldentee.com for much more on the courses and the exciting new features! Desert Valley Resort: Vegas, baby. With Sin City cathedrals looming in the distance—serving as an unfamiliar trackball backdrop—it’s time to test your luck (and skill) in Las Vegas. The fairways are lush and full of life, although the desert elements are evident early and often, reminding you of the terrain when you stray off course. The big gamble on Desert Valley Resort will come on the par-3s. Do you put all your chips to the center of the table or play it safe? Sparkling Waters: Deep in the wooded wilderness, settled between tall, thick pines, glass-surfaced ponds, streams and the occasional wayward black bear is Sparkling Waters, the place where treasured camping trip meets Golden Tee. Ely, Minnesota isn’t just the home of iron ore mines; it also houses a golf course that embraces the joy nature brings. As soothing and quiet as the scene might seem, the layout will test every aspect of your game. Park the RV, pitch a tent and light a fire; stay a while. The Pearl Lagoon: On the other side of the world, tucked away in rugged utopia, lies one of the most stunning virtual golf courses ever created. Welcome to Sirinat, Thailand. The hypnotic blue water of the Andaman Sea will have you relentless calling for a Fly-By, hoping each button push will somehow bring you closer. With this beauty comes the unpredictable nature of dense jungle, which can test you in unexpected way. Be your own guide, and don’t forget bug spray. Celtic Shores: If you listen closely, you can hear the faint sound of Irish music playing in the distance at one of the many pubs nearby. Doolin, Ireland, a place known for its food, drink and surf, also has quite the history when it comes to golf. Don’t let that fool you, however. Celtic Shores not your traditional links course. The pot bunkers are unique from any you’ve climbed in before, and the elevation will have you stopping to enjoy the views. Just wait until you see what it waiting for you on Hole 17. Rocky Hollow: One part Rockies, a dash of Grand Canyon and a solid serving of desert, Rocky Hollow is a buffet of life out west. Centered in Moah, Utah, just 18 miles from the Colorado border, your 18-hole expedition will showcase the various traits this area has to offer. The water is scarce, but it can be found in the places you tend to visit without purpose. And the hard rock surfaces scattered throughout can be your worst enemy, and on occasion, your best friend. Explore with caution. Read up on some of the exciting additions, features and changes coming to Golden Tee 2015. As we post updates, we'll update this list. Enjoy.